The Subdivided Rectangles method is how most people think to draw their first set of stairs; it’s intuitive and simple, but it’s also a bit more time-consuming than the other methods. The key to the Subdivided Rectangles method is to use a special trick you can do with edges: Called Divide, it lets you pick any edge and divide it into as many segments as you want. If you know how many steps you need to draw but not how deep each individual tread needs to be, this comes in really handy. Here’s how the Subdivided Rectangles method works. Draw a rectangle the size of the staircase you want to build. Model steps as a group, separate from the rest of your building, and move them into position when they’re done. With the Select tool, right-click one of the long edges of your rectangle and choose Divide. If your staircase is wider than it is long, right-click one of the short edges, instead. Before you do anything else, type the number of treads you want to create and press Enter. 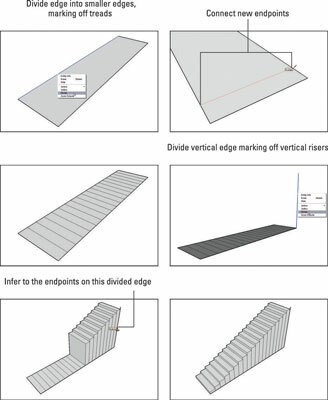 This command automatically divides your edge into many more edges, eliminating the need to calculate how deep each of your treads needs to be. Essentially, each new edge becomes a side of one of your treads. Draw a line from the endpoint of each new edge, dividing your original rectangle into many smaller rectangles. You can use the Line or the Rectangle tool to do this; pick whichever one you’re most comfortable with. From one of the corners of your original rectangle, draw a vertical edge the height of your staircase’s total rise. Use the Divide command to split your new edge into however many risers you need in your staircase (generally your number of treads, plus one). Repeat Steps 2 and 3 to do this. The endpoints of your new, little edges tell you how high to make each step. Push/pull the rectangle that represents your last step to the correct height. Use the hover-click technique: hover over the endpoint that corresponds to the height of that tread and click again. Your step is automatically extruded to the right height. Extrude your highest step first, but remember that it doesn’t go all the way to the top. You always have a riser between your last step and your upper floor. Repeat Step 7 for each remaining step. Use the Eraser to eliminate extra edges you don’t need. Don’t accidentally erase geometry on the part of your staircase you can’t see. Turning on Back Edges (View→Edge Style→Back Edges) is a nice way to see “through” your model without resorting to X-Ray mode.